A personal selection of our best loved wines - all extremely good now but with the structure to get even better. Two bottles of each of the following - a classic Marlborough Sauvignon Blanc from Tinpot Hut, Fournillon's delicious Chablis, a smooth Argentine Cabernet Sauvignon from Sottano, a superb Chianti Classico Riserva from Fonterutoli in Italy, a Marques de Riscal Rioja Reserva from Spain, and a stunning Chateauneuf-du-Pape from Closerie de Vaudieu. 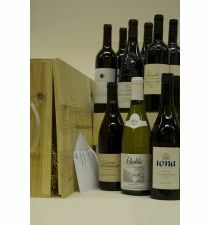 Packed in two six bottle wooden boxes with personal message and next working day delivery (+£6.65).